In a decade punctuated by revivals (garage rock, post punk) it is rare to come across a band with a completely original sound. 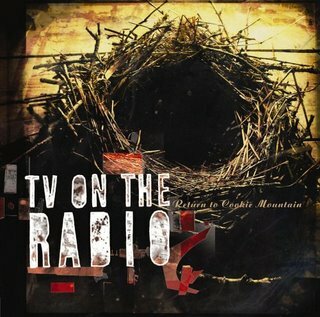 TV on the Radio are one of those rare bands. Hailing from the same New York art/music scene as Liars, Yeah Yeah Yeahs, The Rapture and LCD Soundsystem, TV on the Radio’s first album ‘Desperate Youth, Bloodthirsty Babies’ received glowing reviews around the world. The band’s combination of complex vocal arrangements, intelligent lyrics and industrial/electronic sounds, as well as a mixture of music styles, was new and exciting. After a change of labels, the recruitment of new band members, and innumerable delays, the follow up to ‘Desperate Youth’ is finally here. The oddly titled ‘Return to Cookie Mountain’ is a progression for the band in every sense. There is a greater variety in sound and mood, while the songs are more complex and, at the same time, more accessible. The album opens with a sequence of songs that is as good as anything I’ve heard in recent years. Unlike ‘Desperate Youth’, which maintained a slow and ponderous pace, ‘Cookie Mountain’ features a number of uptempo tracks. ‘Wolf Like Me’ rattles into life with the force of a locomotive. Vocalists, Tunde Adebimpe and Kyp Malone, trade lyrical blows over layered guitar and droning synths, until a shift in tempo halfway through the song ushers in a chorus of music box sounds. ‘I Was A Lover’ starts with a stuttering mechanised beat, wheezing synth and clanging guitar sample. The mood is dark and unsettling. The lyrics suggest paranoia and schizophrenia. Later, the narrator confronts a clone who ‘wears a brownshirt’ and whom he ‘seduces when there’s no one around’. ‘Province’ is a love song of sorts. Messrs Adebimpe, Malone, and a certain Mr Bowie, harmonise about ‘autumn leaves’ and ‘memories precious as gold’ over shuffling beat and sparse piano. ‘Province’ is followed by another uptempo track, ‘Hours’. The song is deceptively simple – trademark vocals over crisp, militaristic drumming. Yet the space around these sounds is filled with hints of saxophone and guitar, glistening keyboards and electronics. These four tracks set the musical and lyrical tone for ‘Cookie Mountain’. It’s a formidable opening. But by starting with such a strong set of songs, the band sets expectations high for the second half of the album. Briefly, it seems we might be disappointed. ‘Playhouses’, builds on the claustrophobia of ‘I Was A Lover’, with layers of noise, voice and increasingly frenetic percussion, while ‘Let The Devil In’ varies the template with the addition of a playful bass melody. The second of these, in particular, is more than a little laboured. After this minor mid-record slump, ‘Dirtywhirl’ introduces another series of remarkable songs, each built around a simple melody, each given moments of light and dark. ‘Whirlwind’ itself starts slowly, just tambourine and vibes, before the drums kick in. The lyrics are ominous – ‘there is a murderess among us’ – with Adebimpe and Malone harmonising to great effect over an almost swinging rhythm. ‘Tonight’ is a quiet melancholic tune, with just chimes and electronics keeping the vocals company. The lyrics too, suggest resignation and decay, citing suicide, ‘dusty portraits’ and ‘blooms falling from the vine’. The third song in this trio, ‘A Method’, starts with little more than whistling and handclaps, before erupting in a storm of percussion. It’s a thrilling moment. Once again, the song is propelled by a simple, even naive melody, with each vocal or instrumental layer adding colour to the mix. There are two more songs on ‘Cookie Mountain’, the sax and clatter of ‘Blues From Down Here’, and the apocalyptic drone of ‘Wash The Day’, but by this time the album’s worth has already been well established. Seven of the eleven songs here are exceptional, and only one (‘Let The Devil In’) is really less than noteworthy. I played ‘Desperate Youth’ again after listening to the new album a dozen or so times, and it seemed somehow crude and incomplete. The basic elements – vocals, guitar loops and effects, percussion – were in place, but the songs themselves seemed a little one-dimensional. ‘Cookie Mountain’ uses these same elements to create far more dramatic, complex and colourful pieces. It might be only be June, but ‘Return to Cookie Mountain’ is an early contender for ‘Album of the Year’. There is a murderss among us refers to Durga, the dancer mentioned two lines later. Far from being “ominous” Durga, the inaccessible, an incarnation of Siva’s wife, destroyed the demon Mahesa at the request of the gods. The song seems to be a mythic statement about salvation through violent love.These people run deep.